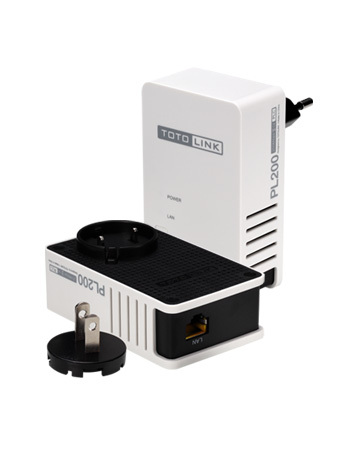 PL200 KIT includes two of the Power Line Adapters that allows users to turn their home’s wiring into a network just by plugging them into available wall outlets. It provides high speed data rate up to 200Mbps and coverage range up to 300 meters that won’t get any influence from obstacles. So it is applicable to a large area of housing and Small Enterprises Office area etc, providing simple and convenient, no radiation, scalable network solutions. -With PL200 KIT working together, no wires are needed to extend your network throughout your house, more convenient and flexible deployment. -Complies with Home Plug AV, IEEE 802.3 and IEEE 802.3u standards. - High-speed data rate up to 200Mbps. - Super small design with detachable power plug. - No need cables, using electrical wires. - Up to 300 meters range, excellent solution for wall and floor crossing. - Plug and Play, no configuration required. - Green product, power consumption reducing up to 65%. - Built-in QoS assures the quality of bandwidth sensitive applications such as voice, video and online games.